Sustainability is increasingly at the forefront of product decision, brand initiatives and strategic planning when it comes to textiles. The use of recycled materials is becoming increasingly important as manufacturers evaluate their supply chain as well as their carbon footprint. Recycled cotton is a great alternative to regular cotton, since it uses no water or chemicals in its manufacturing process and requires no farmland. Obviously, because this is a recycled product, there are no pesticides involved in its production. The largest volume of recycled cotton sources is produced through pre-consumer waste, such as cutting scraps. Post-consumer waste is more difficult to sort through due to various colour shades, fabric blends, and it is generally a more labour-intensive process. Recycled cotton fibres are often shorter than virgin cotton which limits their end-use applications. Frequently, recycled cotton is blended with other textiles to ensure its uniformity, strength and durability. 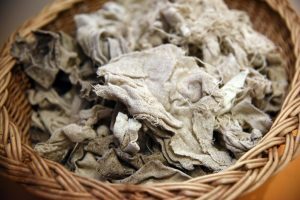 However, the benefits of recycled cotton far outweigh its shortcomings. Using recycled fibres greatly reduces CO² and fossil fuel emissions. Recycling diverts cotton from landfill. In 2018, over 300,000 tonnes of textiles went to landfill in the UK alone¹, so clearly recycling is one of the ways forward to make our textiles industry more sustainable. A small basket made from wood with textile waste.